If you’ve been following my blog for a while, you may remember that I did a cooking segment on live tv last fall. And excitingly, they invited me to be back their show on a couple weeks ago. I gladly accepted, and had SUCH a blast! While being on tv, especially live tv, is a bit nerve-wracking, the fun of it makes it worth the slight anxiety. Check out the video below to see the full clip! While the segment focused on these fantastic Honey Oat Cinnamon Muffins, I gave a shoutout to this Honey Oat Bread, since it uses all the same ingredients as the muffins, plus yeast. And conveniently? It’s super delicious! It came together easily + quickly, + the results were fantastic. A lightly-sweet, hearty, flavorful bread that is super versatile. I love it toasted with a little fresh fruit jam or butter, or it also makes for a delicious sandwich bread, especially if the sandwich has both savory + sweet notes (think: grilled gruyere cheese with pears). So, if you’re looking for a simple, super scrumptious new bread to make, give this loaf a try! Stir 1/4 cup warm water + yeast in large bowl. Let stand 10 minutes to dissolve yeast. Stir in remaining 1 1/2 cups water, 3/4 cup oats, honey, oil, + salt. Stir in enough flour to form a soft dough. Coat another large bowl with oil. Transfer the dough to oiled bowl + turn to coat. Cover with plastic wrap, then kitchen towel + let rise at room temperature until doubled in volume, about 1 hour. Oil two 8.5 x 4.5 x 2.5-inch loaf pans if making two small loaves. Punch down dough; shape into 2 loaves. Place 1 loaf in each pan. Cover + let rise in warm draft-free area until almost doubled in volume, about 20 minutes. Great job on the tv segment, Amy! You’re a natural I love homemade bread made with oats, it’s so hearty! This one is a must-try for me. What a great segment! You look so comfortable in front of the camera. Now I don’t know which to try first – your muffins or your bread. Both look great! This sounds sooooo good! Love it! This bread looks perfect! You did so great on TV! You are a natural – Great job! Can you sub old fashioned oats for the quick cooking oats I wonder. I would love to make the bread for the kids to take to school and I have a ton of old fashioned oats in the house. Being on t.v. sounds so exciting. You did great. I love this bread! You are a natural at this! If you were nervous, I couldn’t tell. The bread (and muffins) looks delicious! Great post Amy! You belong on T.V and so does this honey oat bread! Amy, that is an absolutely wonderful looking loaf of bread, congrats with the t.v. gig, I am sure you were amazing! I love homemade bread. The smell alone is worth the effort. This bread looks perfect! Amy, you’re a natural – I’ll be expecting to see you on Food Network soon! look at you ms. tv star! I’m so impressed! You were great on camera! Definitely convinced me to try those muffins ASAP! Great job! That’s so exciting. The bread looks so fluffy and light, too. I made this yesterday. The old fashioned oats worked out just fine. I started it in the bread machine and finished it in the oven. Thanks for the great recipe! You’re a star!! Any tips for being in front of the camera? Amy, you did amazing on the cooking segment! So calm, friendly and knowledgeable. Absolutely loved seeing you ace this appearance! These muffins are a must-try, as is the bread. Both look perfect! Aww, thank you Todd! I don’t have any big tips, other than to be yourself + focus on how awesome the experience is, rather than the anxiety of being on tv. That worked for me! Fearless is the correct name…you looked so natural appearing on live TV . You are so sweet, Karen – thank you! And thanks to everyone for your kind words + support about my tv segment – you all make my day!! You look like a pro on tv! Homemade bread is the best! 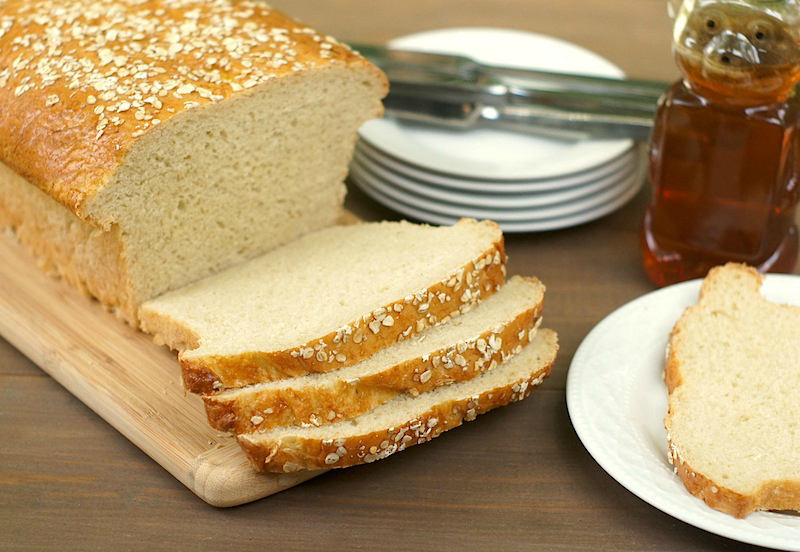 This honey oat bread looks so good! Congrats – you were fantastic! Whoa – you are great on camera. I am impressed. You are right, too. It is nerve wracking, but I’d never know you were the least bit nervous. Nice job! And the muffins and bread both look wonderful! Another slam dunk, Amy. We eat a lot of homemade bread and so I had to try this recipe. It’s wonderful! Like another of your readers I used old fashioned oats and also did one loaf in a loaf pan and another in my shallow 1 quart corning ware dish to give it a rounded shape after baking. Thanks for sharing! Congrats on your 2nd tv appearance-so much fun! Love the look of this bread -super yum! Congrats! You did a wonderful job–I see why you were invited back! Wow, Amy, you are so calm and cool (and cute) — an absolute natural in the kitchen and on TV! No jitters, no “uhs” or “ums.” Congrats!! Love the “middle of the night” snack idea. Plus I can’t wait to make the honey oat bread. It looks like the perfect sandwich bread! Hrm, a tasty bread recipe that looks easy-ish and doesn’t require a bread machine. Yay! Made this again – I forgot how good it was! !